It’s a Wednesday evening and four women sit in a small room holding guitars, occasionally sipping wine. A tall blonde named Mandy Rowden, 30, stands in front, teaching the ladies how to play Winter Winds by Mumford & Sons. 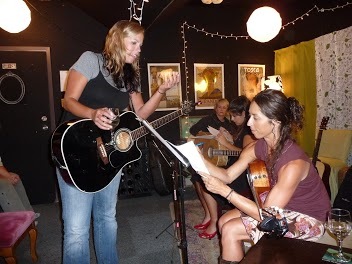 One woman watches Rowden’s rapidly-strumming hand, another furrows her brow while playing the pattern and a third taps her foot to the rhythm she is trying to make on her guitar. The women are all members of Girl Guitar, a program Rowden began in 2007 to fuse her passion for musical performance with her gift for teaching. Girl Guitar classes are held at The Music Lab on Oltorf Street. In addition to encouraging students to drink wine in class, Rowden stresses the importance of having fun and confidence while playing, no matter what your skill level. At the end of each six-week class, students play a few songs in a showcase at Antone’s Night Club. Performing on stage at a world-famous music venue is both awesome and intimidating for beginners. 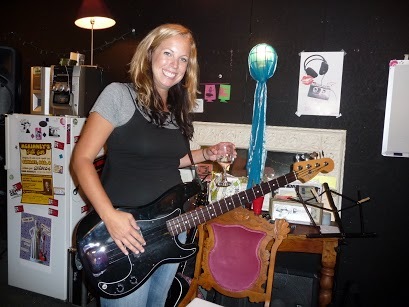 “The first time I went on stage I was shaking,” says Suzanne VanRandwyck, 47, who has been a Girl Guitar member for six months. Having recently performed at her third showcase, VanRandwyck says she now cracks jokes with the audience and feels fairly relaxed while performing. Many of Rowden’s students say that Girl Guitar forced them to face a variety of fears they needed to overcome. “Mandy and Girl Guitar teach you to go beyond your limits and have no fear,” says Jennifer Kiger, 51, a one-year veteran of the program who just completed her sixth Antone’s showcase. Despite the unintentional formation and success of Girl Guitar, Rowden says this is always what she imagined herself doing. 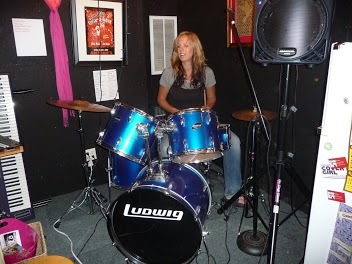 Rowden’s ability to create an entertaining environment makes her classes both unique and addictive, according to her students. Though she doesn’t actively advocate the idea of girl power, Rowden acknowledges that playing guitar is still mostly a man’s arena. Despite this disparity, Rowden praises the resources and support available for Austin’s female musicians. She cites Women in Music Professional Society (WIMPS) and its monthly luncheons as a great networking resource for women. When she isn’t busy helping Austin’s women achieve their musical aspirations, Rowden can be seen performing solo, or collaborating with fellow musicians such as Billy Abel. And because she plays seven instruments – violin, piano, bass, drums, harmonica, and mandolin in addition to guitar – Rowden substitutes in a variety of bands. Rowden’s musical skills were sparked when she started learning classical violin at six years old. Soon thereafter, she began playing piano, and by ten years old she was being paid to play at events in her hometown. It wasn’t until she was a 21-year-old Texas State University student that she “caught the bug for live music” at an open mic night in San Marcos. With a thriving music business and two successful bands, it looks like Rowden has no shortage of opportunities to feel that rush. Great story on following your interests to make an exciting career!